Posted on Friday, March 2nd, 2018 at 9:00 am. Book in for a bike service at our Christchurch branch, and you’ll likely meet the Lloyd brothers. Jake and Toby hail from Tavistock in the UK and are currently in New Zealand on working holidays. We pinned them down for a quick chat to find out more about their biking backgrounds and get the lowdown on Christchurch’s MTB scene. How long have you been biking for, and what initially sparked your interest? Jake: I have been biking on and off for about 12 years. We had a skatepark and local woods near our home when growing up which we used to go to after school and at weekends. The rest they say is history! Toby: I grew more of an interest in bikes and started riding trails around 2005. My family moved house and we were within riding distance to the local woods. This enabled me to ride at the weekend and sometimes after school growing my love for bikes and riding. What’s your favourite ride or trail? Jake: I’m constantly finding new exciting and challenging trails here in New Zealand, a favourite would be Rad Sick trail at Victoria Park at Port Hills. 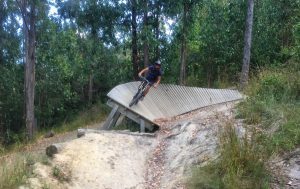 Toby: I haven’t ridden many trails while I’ve been in New Zealand and only a few that aren’t that well known in the UK. There are some good trails in a town called Tavistock near to where I lived in the UK, but here in New Zealand, I’ve found some good rides around Victoria Park and the Adventure Park also looks as though it has some great runs which I’m soon to check out. I’m more into downhill/freeriding, but I tried out a 27.5” which was more of an all mountain/enduro and thought it was awesome. Not only do they climb well, but they descend better than expected. Best spot for after-biking drinks? Jake: Most of our biking is done after work and so we usually head home afterwards for dinner and a beer. Toby: As I’m on my working holiday, I’m torn between trying to ride as much as possible, but also work and save up as much as I can. I’d usually drink at home with my housemates, but a place I like is Burgers & Beers Inc. It has a decent selection of burgers and of course, great beer. Jake: I really like to explore on foot, whether it be looking for new trails or hiking up the mountains. When I’m at home in the UK I play a lot of hockey. Toby: If I’m not riding or working, I tend to either explore in and around Christchurch. But I also enjoy editing videos and clips of myself and friends riding. I quite enjoy the media side of things and putting a little sequence together for others to see. What’s your top tip for keeping your bike in perfect condition? Toby: My tip to keeping a healthy bike is to just keep on top of it. You can get a cheap bike or an expensive bike, but it’s best to keep it clean and maintained so there is less likely to be an issue out on the trail. Although, there is the chance you get things a bit wrong and you run out of talent while riding. Do you have any must-do rides or destinations? Jake: From my experience, New Zealand as a whole is a must-do destination that I would highly recommend for any type of biking. Dyers Pass here in Christchurch is a climb to get ticked off the list! Toby: I wouldn’t say I have any must-do rides or places to go, but I would say just enjoy yourself. Do what kind of riding you feel like and don’t do anything you’re not comfortable with. Check out a clip of Toby riding here. And if you think your bike could benefit from a tune-up from an experienced bike mechanic, we offer servicing in both our Christchurch and Auckland branches. Send us an email, or give us a call on 03 982 2966 (Christchurch) or 09 257 4673 (Auckland).